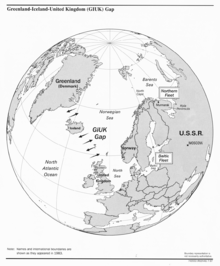 Exercise Strikeback was a major naval exercise of the North Atlantic Treaty Organization (NATO) that took place over a ten-day period in September 1957. As part of a series of exercises to simulate an all-out Soviet attack on NATO, Exercise Strikeback was tasked with two objectives. Its initial objective was the deployment of NATO's naval forces (designated the "Blue Fleet") against other NATO forces attempting to simulate an "enemy" navy that featured a large number of submarines (designated the "Orange Fleet"). Its other objective was to have the Blue Fleet execute carrier-based air strikes against "enemy" formations and emplacements along NATO's northern flank in Norway. Exercise Strikeback involved over 200 warships, 650 aircraft, and 75,000 personnel from the United States Navy, the Royal Navy, the Royal Canadian Navy, the French Navy, the Royal Netherlands Navy, and the Royal Norwegian Navy. As the largest peacetime naval operation up to that time, military analyst Hanson W. Baldwin of The New York Times said Exercise Strikeback gathered "the strongest striking fleet assembled since World War II." Operation Strikeback and the other concurrent NATO exercises held during the fall of 1957 would be the most ambitious military undertaking for the alliance to date, involving more than 250,000 men, 300 ships, and 1,500 aircraft operating from Norway to Turkey. We have... an air-ground shield which, although still not strong enough, would force an enemy to concentrate prior to attack. In doing so, the concentrating force would be extremely vulnerable to losses from atomic weapon attacks... We can now use atomic weapons against an aggressor, delivered not only by long-range aircraft, but also by the use of shorter range planes, and by 280 mm. artillery... This air-ground team constitutes a very effective shield, and it would fight very well in case of attack. We need allies and collective security. Our purpose is to make these relations more effective, less costly. This can be done by placing more reliance on deterrent power and less dependence on local defensive power... Local defense will always be important. But there is no local defense which alone will contain the mighty landpower of the Communist world. Local defenses must be reinforced by the further deterrent of massive retaliatory power. A potential aggressor must know that he cannot always prescribe battle conditions that suit him. With the establishment of NATO’s Allied Command Atlantic (ACLANT) on 30 January 1952, the Supreme Allied Commander Atlantic (SACLANT) joined the previously-created Supreme Allied Commander Europe (SACEUR) as one of the alliance’s two principal parts of the NATO Military Command Structure. In addition, Allied Command Channel was established on 21 February 1952 to control the English Channel and North Sea area and deny it to the enemy, protect the sea lanes of communication, and Support operations conducted by SACEUR and SACLANT. The following key NATO military commands were involved in a series of alliance-wide exercises, including Operation Strikeback, during the Fall of 1957. As part of the response to a theoretical Soviet attack against NATO on all fronts, Operation Strikeback would test the capabilities of Allied naval forces (Blue Fleet) by tasking them to destroy the enemy navy (Orange Fleet) and its huge submarine fleet, protect transatlantic shipping, and undertake sustained carrier-based air strikes against the enemy positions. Beginning on 3 September 1957, American and Canadian naval forces got underway to join British, French, Dutch, and Norwegian naval forces in eastern Atlantic and northern European waters under the overall command of Vice Admiral Robert B. Pirie, United States Navy, Commander, United States Second Fleet, acting as NATO's Commander Striking Fleet Atlantic. While en route, the U.S.-Canadian naval forces executed Operation Seaspray, a bilateral naval exercise to protect Blue Fleet’s vitally-important underway replenishment group (URG) from enemy submarine attacks. The nuclear submarine Nautilus and the conventional submarine Trigger completed operations in the Arctic and joined 34 other U.S. and allied submarines temporarily assigned to the Orange Fleet. USS Mount McKinley was based in Portsmouth Naval Base as the command communications base for the Orange forces controlling Comsuborangelant/Comphiborangelant for the duration of the Exercise. Operation Strikeback itself began on 19 September 1957, involving over 200 warships, 650 aircraft, and 65,000 personnel. To provide a more realistic simulation of protecting transatlantic shipping, over 200 merchant marine vessels, including the ocean liners Queen Mary and Ile de France, also participated as duly-flagged target ships for the exercise. Blue Fleet hunter-killer (HUK) groups centered around the carriers Essex, Wasp, and Tarawa, as well as submarines and land-based anti-submarine patrol aircraft, executed Operation Fend Off/Operation Fishplay to identify, track, and contain the breakout of the enemy Orange Fleet’s submarine force along the Greenland-Iceland-UK gap (GIUK gap"). From somewhere southeast of Greenland came the crackle of an urgent radio message: "Being fired on by Orange surface raider. Inchcliffe Castle." With that alert from a famed but fictitious merchant vessel, simulated hell broke loose in the North Atlantic. Out to punish the "aggressors," a six-nation Blue fleet totaling nearly 160 fighting ships began steaming toward Norway. In the Iceland-Faeroes gap, 36 Orange submarines, including the atom-powered Nautilus, lay in wait. The U.S. destroyer Charles R. Ware was "sunk"; a "torpedo" slowed down the carrier U.S.S. Intrepid,[clarification needed] and H.M.S. Ark Royal had a hot time beating off the assaults of Britain-based Valiant jet bombers. But by early afternoon, Blue carrier planes got through to make dummy atom attacks on Norway's ports, bridges and airfields. Into the midst of this earnest make-believe strayed a Russian trawler - a real one. The Russian, being overtaken, had the right of way and held it, passing diagonally through the entire NATO fleet as the big ships refueled and moved beyond her. Following the conclusion of Operation Strikeback, U.S. naval forces conducted Operation Pipedown, involving the protection of its underway replenishment group while en route back the United States. I am not in a position to criticize political decisions, but I say this as a professional man with over 40 years' experience — I cannot carry out my task as given to me at the moment without more forces. In recent years the submarine has, without any doubt at all, gone a very long way ahead of the devices with which we are presently equipped to sound and destroy it. Task Force Alfa was created by the U.S. Navy to develop improved ASW tactics and technology by integrating carrier-based ASW aircraft, land-based patrol aircraft, refitted destroyers, and hunter-killer submarines. NATO Undersea Research Centre was established by SACLANT on 2 May 1959 in La Spezia, Italy, to serve as a clearinghouse for NATO's anti-submarine efforts. Operation Strikeback was the final deployment for the battleships Iowa and Wisconsin until their re-activation in the 1980s by the Reagan Administration. Finally, on the technical level, Operation Strikeback saw the first use of single sideband (SSB) voice communications for tactical operations by the United States Navy, and HMS Bulwark was the first Royal Navy carrier to use a magnetic loop communication system. In addition to Operation Strikeback, which concentrated on its eastern Atlantic/northern European flank, NATO also conducted two other major military exercises in September 1957, Operation Counter Punch involving Allied Forces Central Europe on the European mainland and Operation Deep Water involving NATO's southern flank in the Mediterranean Sea. The following is a partial listing of naval forces known to have participated in Operation Strikeback. All-Weather Attack Squadron 33 (VA(AW)-33) Det. Light Photographic Squadron 62 (VFP-62) Det. Utility Helicopter Squadron 2 (HU-2) Det. Airborne Early Warning Squadron 12 (VAW-12) Det. All-Weather Attack Squadron 33 (AV(AW)-33) Det. Utility Helicopter Squadron 2 (UH-2) Det. All-Weather Fighter Squadron 4 (VF(AW)-4) Det. 24 September 1957 – An F4D Skyray jet fighter crashed into the sea while attempting to land back on board the USS Saratoga. During the subsequent search and rescue, two S2F-2 ASW aircraft of VS-36 off the USS Essex collided in mid-air and crashed into the sea. Two additional F4D Skyray aircraft crashed following a mid-air collision off Andøy, Norway. The total loss of life was 11. 26 September 1957 – An A3D-1 Skywarrior attack bomber crashed into the stern flight deck ramp while attempting to land on board the USS Forrestal (pictured). The aircraft was lost at sea, but the three-man crew was recovered. Patrol Squadron 8 (VP-8) operated out of Argentia, Newfoundland. Patrol Squadron 10 (VP-10) operated out of Keflavik, Iceland. Both squadrons flew Lockheed P2V-5F Neptune ASW patrol aircraft. The following units of the United States Marine Corps participated in Operation Strikeback in September 1957 are listed below. Wikimedia Commons has media related to Operation Strikeback. ^ Baldwin, Hanson W. (22 September 1957). "100 Fighting Ships in Vast Exercise". The New York Times. Retrieved 2009-09-28. ^ a b c "Chapter 9". NATO the first five years 1949-1954. NATO. Retrieved 2008-11-03. ^ Key Jr., David M. (2001). Admiral Jerauld Wright: Warrior among Diplomats. Manhattan, Kansas: Sunflower University Press. p. 333. ISBN 978-0-89745-251-9. ^ a b c "Emergency Call". TIME. September 30, 1957. Retrieved 2008-10-03. ^ "Chapter 3". NATO the first five years 1949-1954. NATO. Retrieved 2008-11-03. ^ "Chapter 7". NATO the first five years 1949-1954. NATO. Retrieved 2008-11-03. ^ "Chapter IX-B". NATO the first five years 1949-1954. NATO. Retrieved 2008-11-03. ^ John Foster Dulles (12 January 1954). "The Evolution of Foreign Policy". Department of State, Press Release No. 81. Archived from the original on 2008-05-14. Retrieved 9 April 2008. ^ "Chapter 7 - The Military Structure - Atlantic Command". NATO the first five years 1949-1954. NATO. Retrieved 2008-01-03. ^ "Chapter 7 - The Military Structure - Channel Command and Channel Committee". NATO the first five years 1949-1954. NATO. Retrieved 2008-09-03. ^ "Appendix 1 — Chronicle". NATO the first five years 1949-1954. NATO. Retrieved 2008-09-03. ^ "Who is who at NATO" (PDF). NATO. Retrieved 2008-10-03. ^ Key, Jr., David M. (2001). Admiral Jerauld Wright: Warrior among Diplomats. Manhattan, Kansas: Sunflower University Press. pp. 329–331, 334–335, 338–342, 357. ISBN 0-89745-251-8. , hereafter referred to as Warrior among Diplomats. ^ "Saratoga". Dictionary of American Naval Fighting Ships. Navy Department, Naval History and Heritage Command. Retrieved 2008-10-03. ^ a b "The day Nautilus came to Portland". Archive. Dorset Echo. October 5, 2007. Retrieved 2008-10-03. ^ "Norwegian subs during the Cold War". Warships1 and NavWeaps Discussion Boards. Retrieved 2008-10-03. ^ Inchcliffe Castle is a fictional ship from the Satevepost Glencannon stories by Guy Gilpatric. ^ a b "All Ashore". TIME. 1957-10-07. Retrieved 2008-11-07. ^ Friedman, Norman (1994). U.S. Submarines Since 1945: An Illustrated Design History. Annapolis Maryland: Naval Institute Press. p. 109. ISBN 1-55750-260-9. ^ Bendict, John R. (Spring 2005). "The Unraveling and Revitalization of U.S. Navy Antisubmarine Warfare". Naval War College Review: 98. ^ "The Goblin Killers". Time. September 1, 1958. Retrieved 2008-11-03. ^ "Antisubmarine Boss". Time. April 7, 1958. Retrieved 2008-11-03. ^ "History". NATO Undersea Research Centre. Retrieved 2008-11-03. ^ "HMS Bulwark". Fleet Air Arm Archives. Retrieved 2008-09-03. ^ "Loss and Ejections: F4D-1 Skyray". ejection-history.org. Retrieved 2008-10-03. ^ "United States Navy Crew Crashes While On NATO Maneuvers In The Atlantic 24 September 1957". Arlington National Cemetery. Retrieved 2008-09-03. ^ "A-3 Skywarrior aircraft lost with crew lists, p. 2". A-3 Skywarrior Association. Archived from the original on May 17, 2006. Retrieved 2008-10-03. ^ "HTML List of Accidents by BuNo Report". A-3 Skywarrior Association. 2003-11-10. Archived from the original on June 19, 2006. Retrieved 2008-09-03. ^ "Second VP-8" (PDF). Dictionary of American Naval Aviation Squadrons Volume 2, Chapter 3. Naval Historical Center. Retrieved 2008-09-03. ^ "Third VP-10" (PDF). Dictionary of American Naval Aviation Squadrons Volume 2, Chapter 3. Naval Historical Center. Archived from the original (PDF) on 2007-03-27. Retrieved 2008-09-03. ^ "Ballykelly's Shackleton Era 1952-1971". Archived from the original on 2008-07-05. Retrieved 2008-09-03. ^ "History - No. 269 Squadron RAF". Archived from the original on April 21, 2008. Retrieved 2008-09-03. ^ Donnelly, Ralph W.; Gabrielle M. Nuefield; Carolyn A. Tyson (1971). A Chronology of the United States Marine Corps, 1947–1964 Volume III. Washington, DC: United States Marine Corps. p. 35. LCCN 77-604776. PCN 19000318200. Sturtivant, Ray; Theo Ballance (1994). The Squadrons of the Fleet Air Arm. Air Britain. ISBN 0-85130-223-8. "Dictionary of American Naval Fighting Ships". Naval Historical Center. Archived from the original on 2000-08-19. Retrieved 2008-08-26. "Dictionary of American Naval Aviation Squadrons Volume 1". Naval Historical Center. Archived from the original on 2008-09-15. Retrieved 2008-08-26. "Dictionary of American Naval Aviation Squadrons Volume 2". Naval Historical Center. Archived from the original on 2008-09-15. Retrieved 2008-08-26. "DANFS Online". www.hazegray.org. Retrieved 2008-08-26. Robeson, Paul (2004-11-08). "The Intrepid from Day One". intrepid-west.org. Retrieved 2008-08-26. "USS Essex Association". USS Essex Association. 1997–2008. Retrieved 2008-08-26. "U.S. Navy Office of Information". United States Navy. Retrieved 2008-08-26. "The National Association of Destroyer Veterans". Tin Can Sailors. Retrieved 2008-08-26. Pike, John (2000–2008). "U.S. Navy". GlobalSecurity.org. Retrieved 2008-08-26. "USS O'Hare (DD-889)". USS O'Hare, DD/DDR 889. 2008. Retrieved 2008-08-26. "USS Harwood (DD-861)". Bushnell & Associates. 1997. Retrieved 2008-08-26. "USS Charles H. Roan (DD-853)". USS Charles H. Roan (DD-861) Association. 1999–2008. Retrieved 2008-08-26. Dannenfeldt, Danny (2006). "USS Charles R. Ware (DD-865)". Archived from the original on 2011-07-17. Retrieved 2008-08-26. "USS Fiske (DDR-842)". USS Fiske DD/DDR 842 Association, Inc. 2008. Retrieved 2008-08-26. "USS Samuel B. Roberts (DD-823)". Samuel B Roberts (DD-823) Shipmates Association. Retrieved 2008-08-26. "USS Johnston (DD-821)". Multieducator. 2005. Retrieved 2008-08-26. "Military History of the USS Corry". USS Corry DD/DDR 817 Association. Archived from the original on 2008-07-03. Retrieved 2008-08-26. "USS Charles S. Sperry DD 697". Destroyers OnLine. Retrieved 2008-08-26. "Northern Europe - September to October 1957". U.S.S. Allen M. Sumner (DD-692) Official Home of the First in its Class. Retrieved 2008-08-26. "History - USS Trumpetfish (SS-425)". USS Trumpetfish SS 425 Veterans Association Inc. Archived from the original on 2007-07-09. Retrieved 2008-08-26. "USS Becuna (SS-319)". Navsource.org. Archived from the original on 2003-12-04. Retrieved 2008-08-26. Albert Nelson Cain. "USS Cadmus". Archived from the original on 2007-10-24. Retrieved 2008-08-26. "A Brief History of HMCS Iroquois (Postwar)". Canadian Navy. Archived from the original on 2004-05-17. Retrieved 2008-08-26. "USS Intrepid Service Data". wa3key. Retrieved 2008-08-26. Ronald G. Dejarnette. "VP Shipmate Directory". VPNavy.org. Retrieved 2008-08-26. "Warships1 and NavWeaps Discussion Boards". NavWeaps. Retrieved 2008-08-26. Dulles, John Foster (12 January 1954). "The Evolution of Foreign Policy". Department of State, Press Release (81). Archived from the original on 2008-04-18. Retrieved 2008-08-28. Clearwater, John (1998). Canadian Nuclear Weapons: The Untold Story of Canada's Cold War Arsenal. Dundurn Press Ltd. ISBN 1-55002-299-7. Donnelly, Ralph W.; Gabrielle M. Nuefield; Carolyn A. Tyson (1971). A Chronology of the United States Marine Corps, 1947–1964 Volume III (PDF). USMC Headquarters - Historical Division. ISBN 978-1481987516. Friedman, Norman (September 1994). U.S. Submarines Since 1945: An Illustrated Design History. Naval Institute Press. ISBN 1-55750-260-9. Jones, William K. (1987). A Brief History of the 6th Marines. USMC Headquarters - Historical Division. ISBN 1-900031-00-0. Key Jr., David M. (2001). Admiral Jerauld Wright: Warrior among Diplomats. Sunflower University Press. ISBN 0-89745-251-8. Sturtivant, Ray; Theo Ballance (1994). The Squadrons of the Fleet Air Arm, first edition. Air Britain. ISBN 0-85130-223-8. USS Wasp Veterans Association (1999). U. S. S. Wasp CV 18. Turner Publishing Company. ISBN 978-1-56311-404-5. Porter, Richard E. (March–April 1977). "Correlation of Forces: Revolutionary Legacy". Air University Review. Retrieved 2008-08-28. Trainor, Bernard E. (February 2008). "Triumph in Strategic Thinking". United States Naval Institute Proceedings. 134 (2). 40 – 42. Retrieved 2008-08-29. "The day Nautilus came to Portland". Dorset Echo. October 5, 2007. Retrieved 2008-11-03. Baldwin, Hanson W. (22 September 1957). "100 Fighting Ships in Vast Exercise". The New York Times. p. 9. Retrieved 2008-08-28. Trainor, Bernard E. (23 March 1987). "Lehman's Sea-War Strategy Is Alive, but for How Long?". The New York Times. Retrieved 2008-11-03. This page was last edited on 22 October 2018, at 22:43 (UTC).